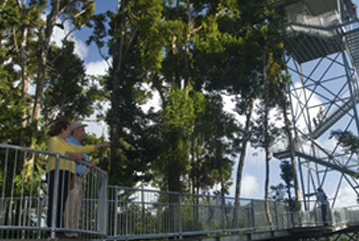 The Skywalk is in the Palmerston Section of Wooroonooran National Park. It is situated on the Palmerston Highway, 27 km from the turnoff from the Bruce Highway and 1 km east of Crawfords Lookout. The skywalk offers a safe and comfortable nature-based experience for all visitors. All facilities and walking tracks, except the top viewing deck of the observation tower, are accessible for wheelchairs with assistance. Alternative routes suitable for wheelchairs and strollers are provided along the Forest walk (indicated by directional signs). All facilities and walking tracks are accessible for visitors with vision-impairment. Tap rails, hand rails and tactile directional signs are provided along all tracks and skywalks. Braille and large print guides are available from the ticket office upon request. Heading just South of Cairns lands you deep in Far North Queensland rainforest, with waterfalls, swimming holes, and all the secret places that locals love. 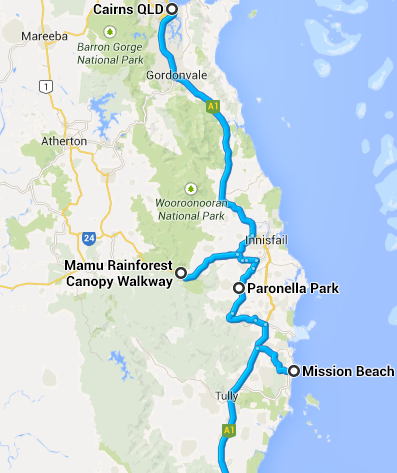 We’ve put together an itinerary of the perfect FNQ day trip for you. A leisurely hour & a half drive south of Cairns, discover the breathtaking beauty of the region’s rainforest canopy at Mamu Tropical Skywalk. This newly-built attraction features walkways and a cantilever, allowing you to experience the rainforest from the forest floor to the canopy. Once you’re done exploring, climb the tower and soak in the views. 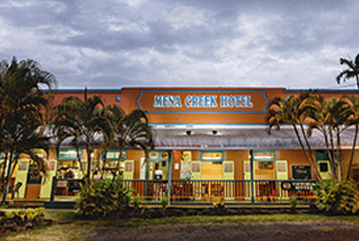 After your workout on the walkways, a pretty drive down the Palmerston Highway lands you at the Mena Creek Hotel. This true country-style pub was built in 1929, and has a reputation for gourmet pub lunches, and the sort of friendly customer service that Far North Queensland is known for. Following this, the perfect way to end your exploration of Far North Queensland’s Great Green Way is to visit Paronella Park. This property is steeped in history, and was voted the ‘Number 1 Must Do in Queensland’ by the RACQ. 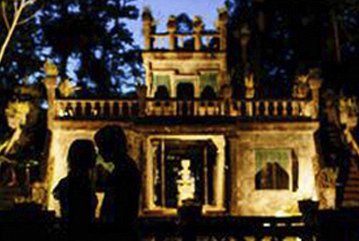 With guided tours both day & night, covering the history of this magical venue, a café, gift shop, and camping available, not to mention some of the best photography opportunities in the region, Paronella Park is sure to be a highlight of your visit.